Portland Meadows kicks off its season on Sunday. We revisit the race track's high-stakes rebranding and last year's opening day. Editor's Note: It's time to break out your seersucker suits, summer dresses, and big hats. 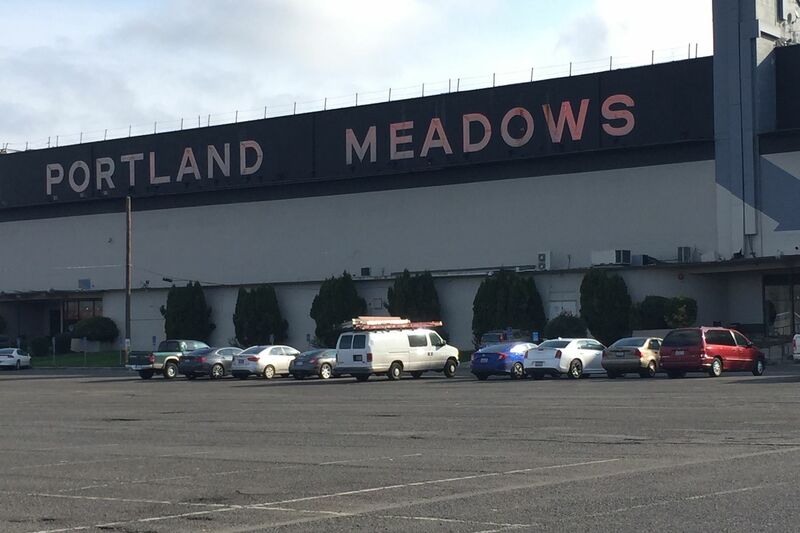 On July 21, Portland Meadows opens the gates on the second season under its new branding as a summer track. Last year in the magazine, we reported on the racetrack's high-stakes bet to rebrand itself with the help of local branding gurus, OMFGCo, alongside a slide show of the jockeys and a behind the scenes video. But we also sent our own gonzo journalist, the dearly missed Stephen Person, and his photographer friend Markus Shearer to send back a dispatch from opening day. Read on (or scroll down to the slide show) for a taste of what you'll get when you hit the track—and a fond memory of a fine gent who we hope will be there in spirit. Stephen Person perched atop the Meadows building. I expected more hats. Wacky ones. Big ones. Hats with quirky sayings and hats resembling Henry Moore sculptures. Cloches, fedoras, bowlers, panamas, floppies and cowboy hats— I expected an ocean of hatted absurdity. “You need to wear a hat,” I was instructed beforehand. Warnings that I’d be scorned and ridiculed if I arrived at the horse track without one came from my friends who had been before. That, however, would not be the case. The closest thing to horse racing that I had experienced in person was a high school track and field meet wherein a kid rolled his ankle down the stretch and crawled on all fours to the finish line. He lost, much in the same way I figured I would if I started throwing money at picking ponies on Opening Day. After all, my only other real knowledge of horse racing came from the 1937 Marx-brothers film, A Day at the Races, and the infamous ice cream scene where Chico swindles Groucho while he’s about to place his bets. This, I thought, was what I would be up against—fast-talking swindlers and general corruption. “There’s no honesty at the track,” I had heard. We were quick out of the gate when we arrived around 11:30 a.m., the three of us, each six-foot-something-and-half, striding effortlessly across the sparsely populated Portland Meadows parking lot that would later turn into a snarl of SUVs and mini-vans, our gait quickening with the immediacy of free booze and barbecue. “Mint juleps for days,” I hoped, as we sought out what we had envisioned as the holy grail of consumption. After a brief run in with the surprisingly accommodating security supervisor, McSwain, as we would later call him, we arrived at the entrance of the white-canopied bar. Hastily downing our first round, we began meandering about the newly revamped grounds of Portland Meadows, investigating what life at the 68-year-old track was like before the new black-and-orange paintjob and re-branding by Portland-based Official Manufacturing Company. The first thing we learned from a local dignitary busy with photo-ops and schmoozing was that, “the place used to be a real dump.” Looking at the facilities now, you’d never be able to guess that. The corridors are adorned with regal paintings of horses and horseman and elegant typeface that prevents even the most inebriated track goers from getting lost on their way to the washroom or paddock. There’s an air of humble sophistication and a welcoming dilapidation that beckons you to envision the heyday of Portland Meadows. When there were horses. Lots of them. The first race of the day featured six long-legged beasts, far fewer than I thought would be running, but the lack of entries didn’t mean a lack of intrigue. When the track bugler played the ever familiar “Call to Post,” small children broke from their parent’s hands and clamored to the edge of the track, piggybacking their brothers and sisters for the best view. The twenty-something crowds of hipsters paused from their cigarettes and mint juleps and readied their iPhones to capture the “pure novelty” of being at the track via Instagram. The seasoned professionals, the stalwart connoisseurs of fine horses and tradition, scanned their race cards one last time assuring themselves of their wagers. Cascade Dynamite, the horse that I had a hunch would win, but resisted wagering on since I didn’t know the difference between “place” and “show,” won the first race of the day, a Quarter Horse competition, and became the first horse to ever win at Portland Meadows in the summertime. 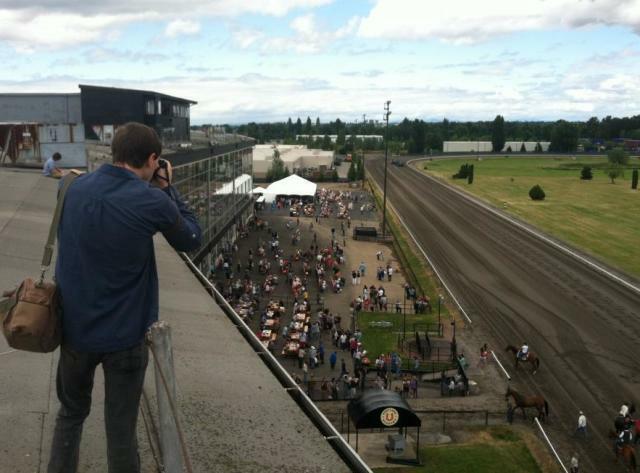 Prior to Opening Day of the current meeting, Portland Meadows was a wintertime-only track. That has now changed for the better. By 2 p.m., the third race of the day was underway and I found myself standing on the back of a bleacher yelling, “GO, GO, GO, GO, GO!” Thanks to a little help from a kind woman bookmaker who helped me decipher the program while some impatient dolt behind me honked his imaginary horn, I took a risk and placed a two-dollar bet on Demauchy, a horse that the program described as, “wouldn’t have to be a monster to win.” Amazingly, it did. After the thrill of winning passed, we decided it was time to do what we had come to do: journalism. We sauntered inside and began searching for McSwain, the security guard who had earlier assured us that he could get us onto the roof of Portland Meadows for some “top notch” photos. Finding him roaming the grounds, McSwain ushered us into a ‘70s-era elevator and up we went. “Ta da!” Just like that we were high above the crowd, looking down on a lake of hats. “Just don’t fall off,” McSwain said as he closed the door and left us alone with our bird’s-eye view and cameras. We snapped, snapped, snapped away, but something else caught our eye—an older man in a white shirt near the announcer’s booth peering down at the track seemingly without blinking. We had to investigate. Carefully we traversed the grey-matted rooftop and approached the box where White Shirt was standing, motionless. From below we could see the passion in his eyes and nearly feel the warmth in his heart. We went around the back and found the door to White Shirt’s box at the end of a long corridor. Hesitantly, we entered. We had stumbled into the official judges box. We explained we were from a local publication doing a story on Opening Day, and they jumped at the chance to explain their jobs and the rich tradition of Portland Meadows. Towering above the former jockeys, we listened as they told us how video poker and the emergence of casinos in Oregon severely undercut the racing industry in the early ‘90s. They explained how the new summer racing program at Portland Meadows would be hard-pressed to survive if people don’t quickly embrace the resurgence of horse racing in Portland, but it was, “absolutely amazing to see all the people here today.” They showed us how a new camera system that takes 2000 pictures a second of the finish line operates and illustrated how the old system of using filmstrips and a wire worked to judge races before the new technology replaced it. They explained how, without the support of new horse racing fans, the future livelihood of riders, trainers, owners, judges, officials, and everyone involved is jeopardized. From them, we learned that our pre-conceived notions of the horse track as a corrupt, swindler-filled place is completely inaccurate, and your chances of winning at the track are actually greater than playing some back-room video poker machine that gives relatively little back to the economy. From them, we learned what it means to be truly passionate. One of them even complimented my hat.